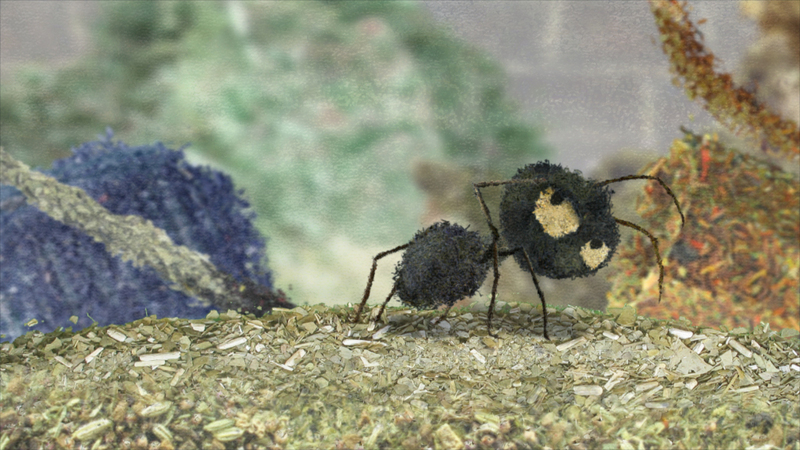 An independently minded ant defies his colony and dedicates his life to pursuing his dreams. Chinti is a delightful animated parable following the life and desires of an independently minded ant. The ant lives and works with his family on a narrow trash-filled shore. He works with a colony of ants, but finds it increasingly difficult to cope with the overly structured and, what is to him, an unfulfilling and meaningless life. Within the rubble, he encounters a photo of the Taj Mahal and becomes completely mesmerized by the beauty of the structure. He dreams of one day viewing the Taj Mahal in all its glory, but without knowing where it’s located or how to get there, he dedicates his life to building his dream for himself. Visually, Chinti is truly a beautiful piece of artistry. Natalia Mirzoyan utilizes a wide variety of tea leaves to create the film. The textures and patterns of the tea leaves creates a painterly three dimensional landscape that appears visually tactile, making it easy to imagine what it would be like to experience it directly. The great level of detail used to create these landscapes is truly remarkable. Every piece of trash seen in the film is not only perfectly contoured, but also carries an identifiable history we can readily imagine. Cans have believable markings and dents. Apples have the appropriate amount of discoloration. We recognize brands and are familiar with the usages of everything we see. In some ways we become excited and lost in the complex simplicity of the textures as objects, and in other ways we become oddly aware of our own wastefulness. And what’s most fascinating is the clever reappropriation of these objects the ant uses to fulfill his dream. How natural and organic the film appears works very well in conjunction with the parabolic nature of the piece. The film takes you back in time and to another world that can only be referenced by the experience of viewing illustrations in a children’s book while it’s being read to you. By the end of the film, a distinct lesson and a deeper meaning has been conveyed, and the simplicity of the lesson itself is familiarly refreshing.